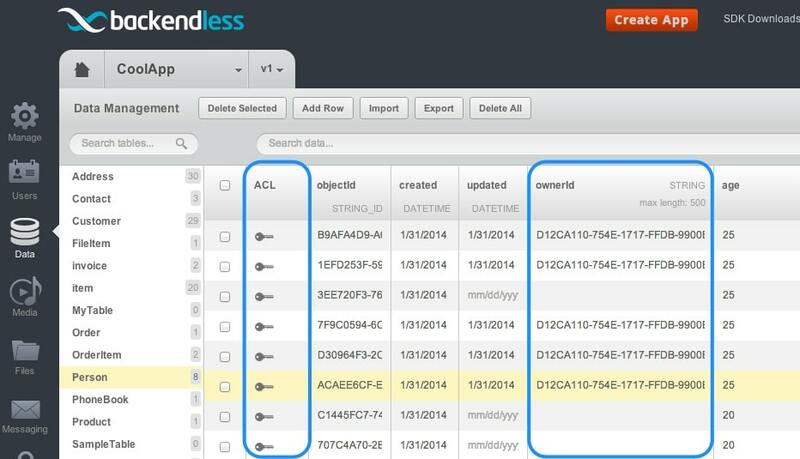 Any time you save an object in Backendless using the Data Service, we automatically assign the ‘owner’ to the object (assuming there is a currently logged in user). Having an association between a user and the objects he created is helpful since it makes it so much easier for a user to retrieve only the objects he owns. Along with the support for Object ACL, we have greatly enhanced the system of permissions for objects and tables. In fact, the system is so flexible that you can configure any kind of scenario for secure data access (load only objects one created, load only objects which were created anonymously, load only objects which belong to users in specific roles, etc). There will be a detailed blog post with the detailed information about Object ACL. Being able to control access to files and folders stored in the Backendless File Service has been one of the most requested features. The wait is finally over. With today’s release you can control access to any file and folder using the same intuitive interface we have for other services. The File Browser interface now includes the “Edit Permissions” link for every single item. Clicking the link you can easily adjust the permission matrix for any user or role in the system. The File Service received quite a makeover in today’s release. In addition to File Permissions, we also added Git integration. Once Git is enabled (you can do it from the Manage > App Settings screen), you can work with your file storage as a git repository. This may be particularly helpful for deploying multiple files or syncing between your local development environment and Backendless file system. We are very excited about this release. There is a lot more that went into it than just these features – most importantly our passion and love for beautifully made software. We have a feature packed roadmap and can’t wait to get some amazing functionality into your hands. We hope you enjoy using it as much as we did designing and coding Backendless.